Some senior Gaelic pupils were visited recently by Ceitidh MacPhee, recruitment officer at Sabhal Mòr Ostaig in Skye, Christie MacLean, a former pupil of Charleston Academy who now works at Bòrd na Gàidhlig and Emma, who is a student of primary education at Sabhal Mòr Ostaig. They spoke to pupils about further education opportunities and the daily lives of students at the college. They reminded pupils about the range of different employment opportunities available to Gaelic speakers. Christie spoke about how she started learning Gaelic in S1 at Charleston Academy, going on to study to Advanced Higher level, then a degree in Gaelic and Development. 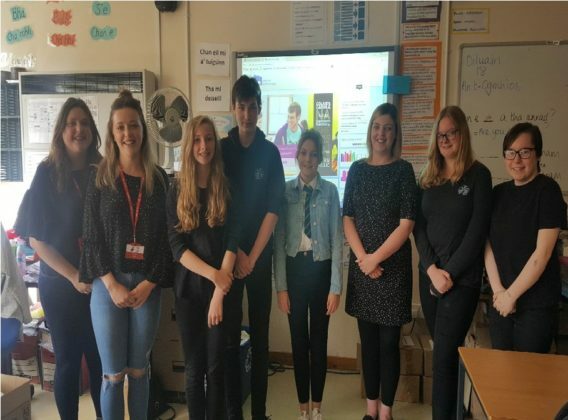 Pupils were interested to hear how she took part in a student exchange, studying Gaelic at St. Francis Xavier University in Nova Scotia, Canada.